Wakanoura offers enchantingly rich seasonal beauty that changes from moment to moment, with tidal flats appearing and disappearing in sequence with the daily inflow and outflow of the ocean. The area’s landscapes, whose history fostered the development of its art and culture and which were praised in Man’yo poetry, continue to enchant people to this day. Wakanoura is a scenic area around Wakaura Bay, which is located south of the city of Wakayama and north of the city of Kainan. Centered around the tidal flats that extend out into the estuary of the Waka-gawa River, this treasure house of beautiful landscapes combines rich, green mountains and vast expanses of ocean, reaching south to the Kumano Sankei-michi Pilgrimage Route Fujishiro-zaka Slope and west to Cape Saikazaki on the Kii-suido Channel. One thousand three hundred years ago during the Nara period, Emperor Shomu visited the area, then known as Wakanoura but written with a different kanji character. Moved by the jewel-like beauty of the series of islands he found there, the emperor issued an imperial edict ordering the area to be protected for all time in honor of the god of Tamatsushima and a god known as Akanoura-no-mitama. A poem penned by the Man’yo poet Yamabe no Akahito, who served the emperor during his royal visit, remains widely known today for the memorable manner in which it praises the area’s scenic beauty. Due to Heian-era poet Ki no Tsurayuki’s inclusion of Yamabe no Akahito’s poem in his Kokin Wakashu anthology, considered the seminal text of waka poetry, the kanji characters used to write Wakanoura were finally changed to the word meaning waka poem in honor of the god of that art form. Senior regents and ministers of the government visited the area when they visited Kumano or made pilgrimages to the Western part of the country, and it appears in numerous waka poems and tales. During the Edo period, Ten Views of Wakanoura, a picture scroll depicting some of the landscapes described in the Man’yo poems and in the Shin Kokin Wakashu anthology of waka poetry, provided inspiration for countless works of art and crafts. The area’s scenic beauty became generally well known during this time, making it particularly appealing to men of culture; as an example, the Rikugien Garden was built in Edo as a recreation of Wakanoura in miniature. The feudal lord Hashiba (Toyotomi) Hideyoshi, who brought the Kishu region under subjection, built Wakayama Castle in Okayama in the northern part of Wakanoura after visiting the area for pleasure. The castle’s name, which was based on the name Wakanoura, later became the basis for the current prefecture’s name. With the ascent of the Tokugawa shogunate, Yorinobu, Ieyasu’s tenth son, occupied Wakayama Castle as the first ruler of the domain, which then produced 555,000 koku of rice. Yorinobu built the Tosho-gu Shrine halfway up Mt. Gongen in the northwestern part of Wakanoura to enshrine his father. He also built a two-storied pagoda at Mt. Imose, which rises over the area’s tidal flats, in memory of his mother, Yojuin (Oman-no-kata). He went on to construct Sandan-kyo Bridge to link the mainland to Mt. Imose and built Kankaikaku Tower, which he then opened to the general public as a place from which they could enjoy the area’s beautiful landscape. Writers and artists like Natsume Soseki have continued to visit Wakanoura in modern times. Onzanso Garden, which was built at Kotonoura, has been visited by members of the imperial family as well as by government ministers. Today, richly traditional processions still bring the shores of Wakanoura alive during the Waka Matsuri Festival, which embodies some 400 years of history. One can see young people and children participate in the festival. Locals carry out environmental preservation campaigns and participate in Man’yo poetry study groups as they endeavor to inherit a remarkable cultural legacy whose appeal transcends the eons and pass it on intact to the next generation. These natural tidal flats are found at the estuary of the Waka-gawa River. 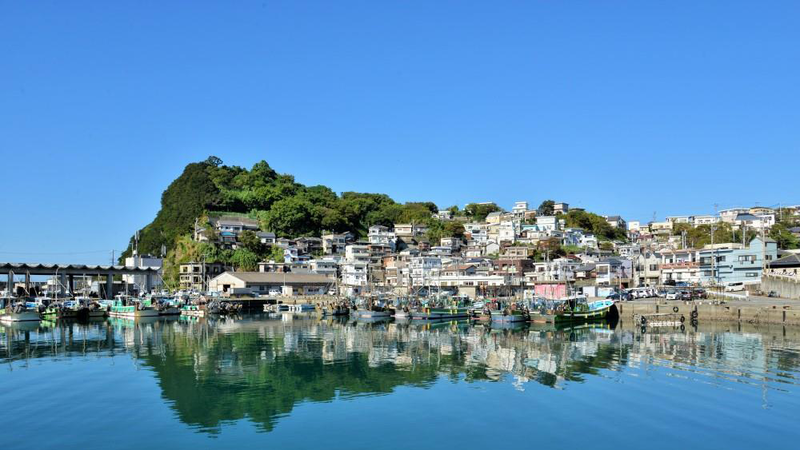 They are described in Man’yo era waka poems, and scenes of cranes taking flight near the flats’ reedy shore have been chosen as among the 10 most beautiful sights of Wakanoura. The sandbar that divides the tidal flats from the open ocean was built as Kataonami Park. The observation platform at the peak of Mt. Takatsushi offers panoramic views of the tidal flats and Kataonami. 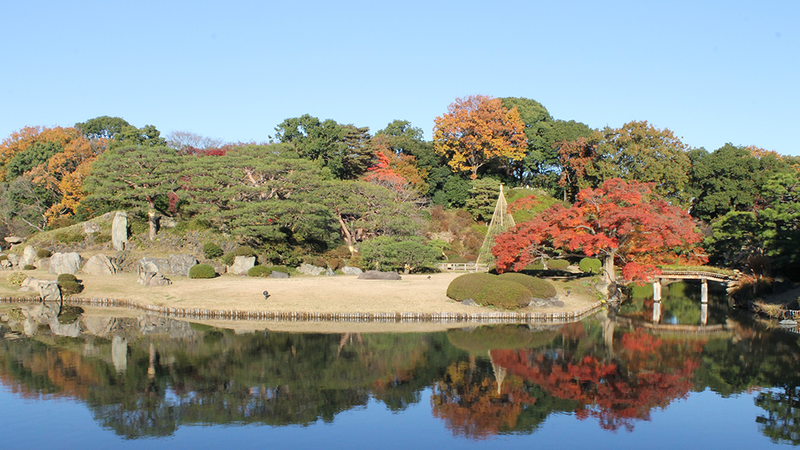 This garden, which was built by Yanagisawa Yoshiyasu, chamberlain to the fifth shogun Tokugawa Tsunayoshi, to serve as a resort villa of the ruler of the domain, is open to the general public. 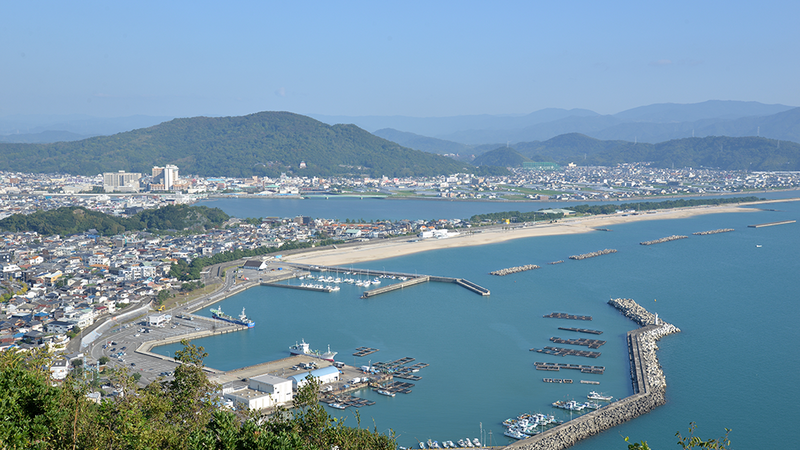 It incorporates the scenic beauty of Wakanoura into its design. Getting there: Located 7 min. on foot from JR Komagome Station. Court poet Yamabe no Akahito accompanied Emperor Shomu on his imperial visit to Kii, during which he wrote beautiful poems praising Wakanoura. Active from 724 to around 736. Must have touched the same sand. Kakinomoto no Hitomaro was typical of the Man’yo era poets. He wrote of his sorrowful memories of his late wife while visiting Wakanoura during his later years. Active from 672 to around 710. One never tires of looking at Tamatsushima. To show those who have not seen it themselves? Fujiwara Kyo, who accompanied Emperor Shomu on his imperial visit to Kii, left seven poems in the Man’yoshu. Some speculate that he was one of Fujiwara no Fuhito’s sons, either Fusasaki or Maro. Prince Arima is executed at Fujishiro-zaka Slope. Emperor Shomu makes an imperial visit to Tamatsushima in the country of Kii. Emperor Kanmu makes an imperial visit to Tamatsushima in the country of Kii. Senior regent Fujiwara no Yorimichi visits Fukiagenohama Beach in Wakanoura for pleasure. Hashiba (Toyotomi) Hideyoshi leads an expeditionary force to Kishu to subdue local unrest. He builds a castle, which he names Wakayama Castle, at Okayama. Asano Yoshinaga builds the main building, Chinese gate, and other structures at Wakaura Tenman-gu Shrine. Tamatsushima-jinja Shrine is restored. Tokugawa Yorinobu arrives in Wakayama. Kishu Tosho-gu Shrine is completed and dedicated. Wakaura Tenman-gu Shrine is repaired and rededicated to enshrine a jinushigami, or land god. Sandan-kyo Bridge and Kankaikaku Tower are built, and a hermitage (which later becomes Kaizen-in Temple) is built on Mt. Imose. Yorinobu dedicates portraits of 36 waka poets at Tamatsushima-jinsha Shrine. Matsuo Basho tours Wakanoura from Koyasan. Kuwayama Gyokushu’s Wakanoura Zukan picture scroll is completed. Tokugawa Harutomi begins building the Suiken Imperial Villa (the site of Yosuien Garden), which is subsequently completed in 1825. The Crown Prince (who later became Emperor Showa) visits Wakanoura. Wakanoura becomes a nationally designated National Monument (Places of Scenic Beauty). 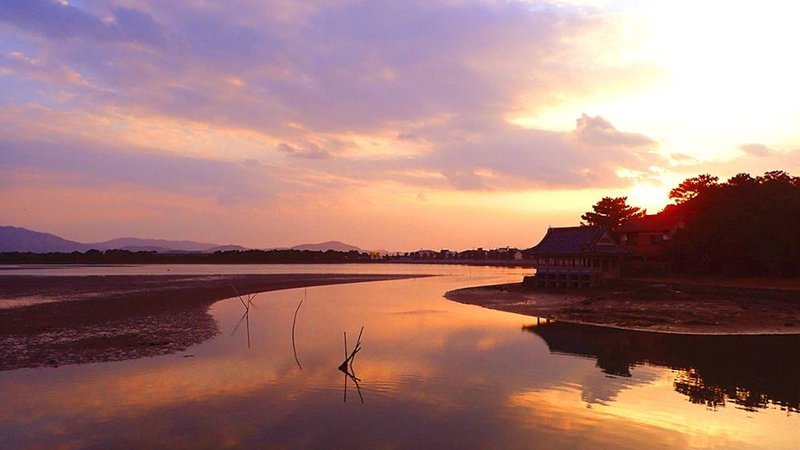 “Treasure House of Scenic Beauty: Wakanoura” receives Japan Heritage status in April.